Arts and Culture | Stakeholder Engagement | About Us | NIKKISO CO., LTD.
Nikkiso's support of the Soukeikai Foundation is helping to take recognition of Kaga Zogan to greater heights. Nikkiso founder, Keijiro Oto, established the Soukeikai Foundation in Kanazawa in 1993 with a commitment to building a stronger foundation for local industries and bolstering traditional culture through the promotion and development of Kaga Zogan. Since its start, the Foundation has been implementing a number of educational and awareness-raising projects to train a new generation of Kaga Zogan workers and promote metalworking techniques. Keijiro Oto was among the first engineers who forged post-war Japan's high-tech industry. His roots and pride in manufacturing can be traced back to the renowned Kaga Zogan craftsman Koji Yamakawa, whose sophisticated techniques have been passed on to generations. When opening the Kanazawa Plant, he established the Foundation with an eye to preserving the art of Kaga Zogan, a time-honored tradition the Japanese should be proud of and pass down to future generations. The exquisite craftsmanship of Kaga Zogan is only made possible by the mastery of an extremely sophisticated technique. You can see the same dynamic reflected in Nikkiso's underlying commitment to producing a wide array of unique products built on original technologies all with an aim to making a positive difference in the world. Kaga Zogan dates back to the late 16th century when the Maeda clan that ruled the area once known as Kaga brought the metalworking technique from Kyoto and made it uniquely their own. It features exquisite and sophisticated designs typically incorporated into the ornamental work adorning samurai sword mountings or horse stirrups. Zogan, or damascening, is the technique of inlaying different metals into a chiseled base metal to form patterns. At one time there were two types of artisans, one specializing in sword mountings and the other horse stirrups. Especially esteemed was the sturdy yet intricate Hira Zogan (flat inlay) technique used to craft highly coveted horse stirrups made in a diverse array of exquisite patterns that were beyond compare. Located on the premises of the Kanazawa Plant, Soukei Kaikan is the place you can see Ishikawa Prefecture's traditional craft of Kaga Zogan and Nikkiso's cutting-edge technologies together under one roof. This exhibition hall features a display of Kaga Zogan work accompanied by an explanation of how it's made as well as Nikkiso's key products and systems. The exhibition hall is open to the public. We invite you to come and visit. 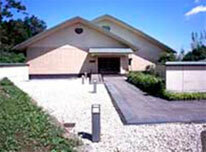 Soukei Kaikan is named after the grandfather and great-grandfather of Nikkiso founder, Keijiro Oto. "Sou" comes from the Chinese characters in "Hokusousai" and "Sousai," pseudonyms of his great-grandfather Koji Yamakawa I and grandfather Koji Yamakawa II. "Kei" comes from the first character in Keijiro Oto's name. The Soukeikai Foundation opened the Tsukiura Studio in April 2008 to pass down traditional craft techniques such as Kaga Zogan and support aspiring metalwork artists. Nestled deep in the mountains, Tsukiura Studio's natural backdrop offers a quiet setting where you can make the most of the passing seasons. The studio where the metalwork artists engage in their creative work is an old renovated traditional house located in Tsukiuramachi, a town in Kanazawa City neighboring Nikkiso's Kanazawa Plant. So far seven young metalwork artists have left the Tsukiura Studio after completing their training and are now working on their own. Kanazawa continues to provide the fertile ground where the Soukeikai Foundation cultivates the skills of budding artists until they grow to become masters of the traditional metalworking technique that is rooted there.